From left to right, Compton Construction, CEO, Harold Compton and Vice President of Operations, Steven Kirk, presenting a check to Glass Axis, Executive Director, Rex Brown. 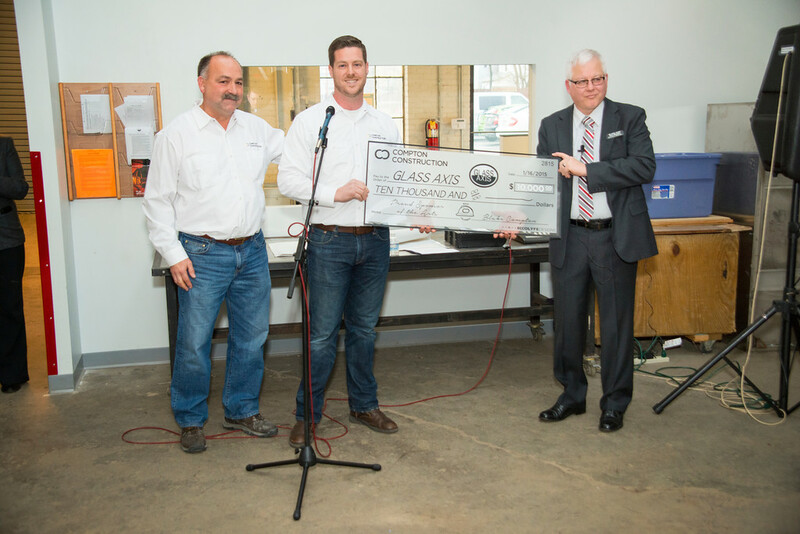 Earlier this month, Glass Axis re-opened their doors to a new 12,500 square foot building in Franklinton, after nearly a year of planning and construction. The 30 year old not-for-profit organization offers creative space dedicated to working with hot and cold glass, including neon tubing, stained glass, bead and jewelry, and furnaces for glass blowing. They offer educational programs and classes dedicated to teaching glass art to anyone and everyone, with a focus on making it affordable. The new location at, 610 West Town Street, now offers studio space for local artists to develop their craft, along with common space for making and learning. There is also a new gift shop and coffee shop, Café Brioso, which is open to the public, where guests can enjoy a warm beverage while watching local artists create! Compton Construction oversaw the renovation of the space, and played a major role in helping move the organization forward. Upon completion of the project, they made a $10,000 donation to the organization at their recent grand re-opening. For more information about the Glass Axis and the re-opening, check out their website.